Shrimp or more correctly called scud patterns often are the big winners for trout success on BC lakes as the fish feed on them throughout much of the year. There are many popular patterns including the famous Werner Shrimp, the Baggy Shrimp and many others but an old favourite from my Kamloop's days is the Drunken Miller.I do not know where this name comes from, perhaps someone out there can inform me of the origin! However, the fly is tied to represent a shrimp carrying an orange egg sac. The insect in this condition may well be more succulent to trout because as when fishing on Roche Lake I have caught fish on this pattern when the regular green only pattern has failed! Together with the Werner Shrimp, the well equipped fly fisherman should have the Drunken Miller in their fly box for those days when the orange egg sac is exactly what those big rainbows ordered. Hook : Size 10 to 14. Tail : Part of the green or brown pheasant shell back cover. Body : Dubbed green seal plus thin orange chenille near the hook eye. Ribbing : Invisible mending thread. The Drunken Miller is another fly where invisible mending thread is the answer for back winding a rib that is practically impossible to see but creates a desired lumpy appearance plus strengthens the fly against unravelling. Start by making a dubbing loop with your invisible thread and insert green seal fur into the loop, twisting until the seal hair ends stick straight outwards. Then wind the dubbed seal from the hook bend to just before the hook eye and tie off. At this point attach no more than two turns of fine orange chenille. The final step is to tie in a green pheasant rump feather just ahead of the chenille and, holding it together, rib it back along the top of the hook body with about five turns of the invisible thread so that a lumpy appearance is created. Allow the pheasant feather to protrude about 1/4 inch past the hook bend thus creating a tail. Tie off, cement the head and you are finished. 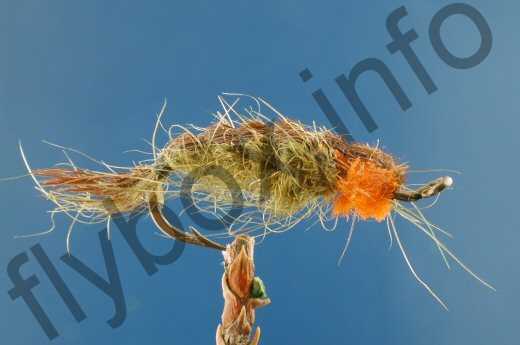 I sometimes wind a few turns of fine lead wire near the hook eye before covering it with the orange chenille. This hastens the sink time to just above the weed beds where you want to fish this fly. Mustad 9671. Currently there are no comments about the Drunken Miller fly pattern from other fly fishermen yet.